If you're reading this article, I probably don't need to tell you that video content accounts for over 74% of all online traffic, or that over five billion YouTube videos are watched every single day. You already know YouTube is an important content tool, and you're ready to start leveraging video for your own business. I'm here to show you how to do it. This article will cover everything you need to know about creating a YouTube channel, so you can start uploading your own videos and growing your audience today. Register a Google account (if you don't already have one). Create a new YouTube channel using you Google account. Optimize your channel for discoverability. Add links and descriptive details to your channel. Upload a profile photo and cover art to your channel. Add videos and optimize them for search. 1. 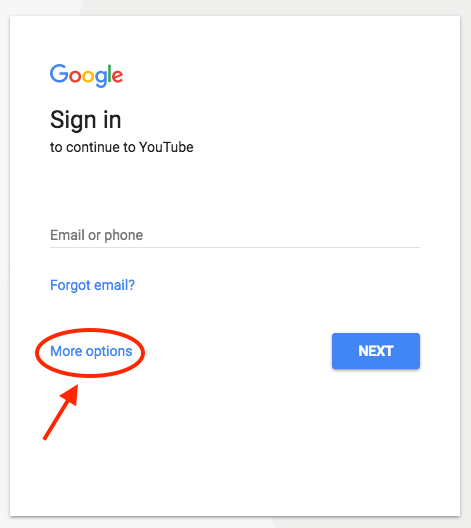 Register a Google account (if you don't already have one). 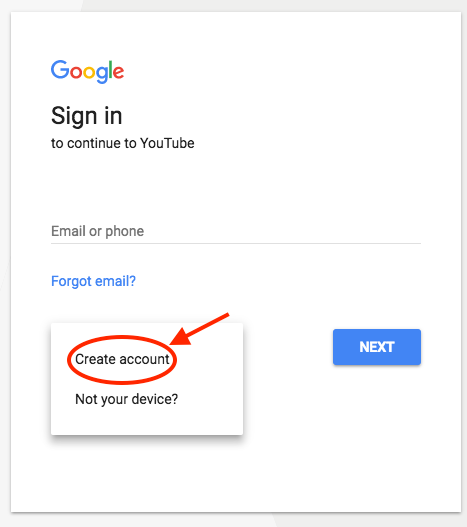 To watch, share, create, and comment on YouTube content, you'll need a Google account. From there, you'll be asked to follow a few steps to create a Google account. Once you've completed them, proceed with the steps below. Go to youtube.com and click "sign in" in the upper right-hand corner. From there, you'll be taken to the same Google sign-in page above. If you have multiple Google accounts, be sure to select the one you want to be associated with the YouTube channel. 2. 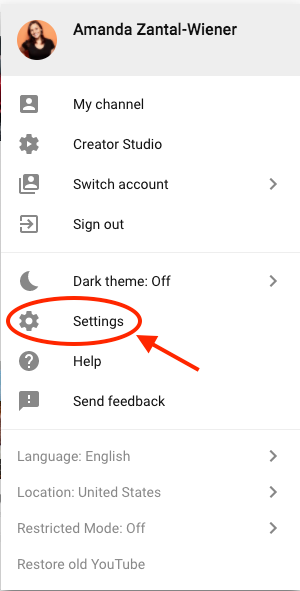 Create a new YouTube channel using your Google account. Once you're set up with and signed into your Google account, it's time to create a channel. Back at youtube.com, click your user icon in the upper right-hand corner. This represents both your Google account and you YouTube account (as YouTube is owned by Google). You'll see a drop-down menu, where you'll want to click "settings." From there, you'll be taken to your account overview. Under "additional features," click "create a new channel." The first step is to create a Brand Account. It can be whatever name you want, and doesn't have to be the same name that you used to create your Google account -- but we do recommend that it reflects the brand the YouTube Channel will represent. After you enter the Brand Account name, you might be asked to verify the account via text message or voice call. If that happens, enter the code you receive from the option you choose. Once you've verified your Brand Account, you'll be taken to the dashboard for your channel. Now, it's time to start customizing it. 3. Optimize your channel for discoverability. We'll start with the fundamental details about your channel. From your channel dashboard, click "customize channel." After you click "customize channel," you'll be taken to your basic channel page, where you'll see a cogwheel on the right, as shown below. Click this cogwheel icon, then click on the section that says "advanced settings." Here's where you'll enter some basic information about your channel, like the country where it's based, as well keywords that help it people discover your channel when they enter search terms that describe what videos they're looking for. These keywords can include what your channel is about, the problems it helps solve, the people and products featured, your industry, and more. From the page shown above, you can then select whether or not you want to appear as a recommended channel on other account pages. 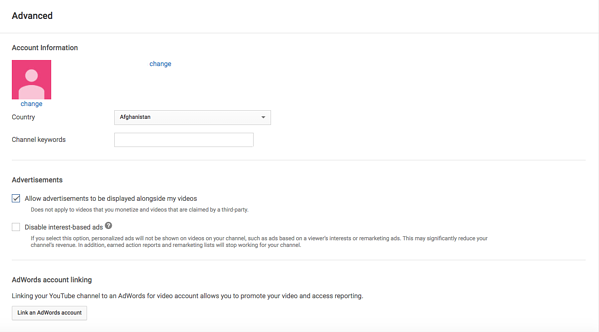 It's also within these settings that you can link a Google Ads account, add a Google Analytics property tracking ID, and make various advertising selections for your channel when you're ready to promote certain videos across the YouTube platform. 4. Add links and descriptive details to your channel. There are two elements of customization for a new YouTube channel: descriptive details, and visuals. Descriptive details tell your channel visitors (and, eventually, subscribers) what purpose your channel serves and the type of video content they should expect to see published by you. Let's add those details now. To describe your YouTube channel for your viewers, you'll want to add a channel description and links to other webpages associated with your brand. Back on your channel customization dashboard, click on the "About" tab. There, you'll be asked to fill in such details as a channel description -- which you can optimize with keywords for more discoverability -- as well as contact information and links to your website and social media channels. Up to five links can overlay your channel art, meaning that the banner on your profile page will contain icons for the links you choose to overlay on this list. To add these links, navigate to the About section of your YouTube channel and click "+ Links." This button will reveal a space where you can add branded links directing users to various websites and social networks where they can learn about and consume more content from you. See what this space looks like below, and how a business might add links to its Facebook, Twitter, and personal website. Your channel art is part of your channel's customization, which we'll move onto next. 5. Upload a profile photo to your channel. When it comes to creating and adding channel art, Google has a plethora of resources for content owners, from a gallery of images to image editing tools. Among this channel art is your profile photo -- this is how YouTube users will identify the creator of a video when browsing video content. You'll see this image appear beneath YouTube videos on the play page, as shown below. If your YouTube channel is linked to a Brand Account, as is the example we used in the previous step, you'll need to update this image in the "About" section of your Google account. Note that this rule also applies to your channel name when using a Brand Account. Click "edit," and you'll be taken to the page shown below, where you can edit your Brand Account information, including your profile photo (which will be displayed on your YouTube channel). We recommend choosing an image with dimensions of 800 x 800 pixels for this profile photo. 6. Add a banner image. Next, it's time to add your banner image. Back on your channel customization dashboard, along the top, you'll see your newly added profile photo on the top-lefthand corner. As far as that gray background surrounding it is concerned, you can (and should) change it to something more, well, you. Here's how. Hover your cursor over this gray background to reveal a small pencil icon on the top-righthand corner. 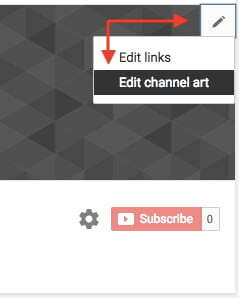 Click this icon and select "Edit channel art" when this option appears, as shown below. Need a little inspiration? Check out this post with some of the best YouTube banners we've found. 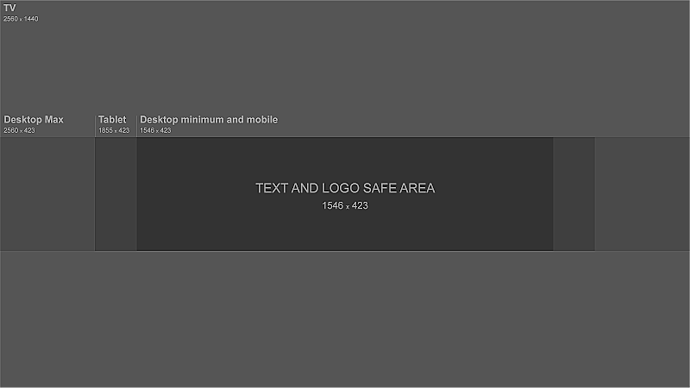 As you can see from the resources above, the minimum dimensions for your YouTube banner image are 1546 x 423 -- this size prevents relevant text and images contained in your banner image from leaking off of someone's screen -- whether that screen is a desktop, laptop, or mobile device. The maximum width for your banner image is 2560 x 423, and your image's file size shouldn't exceed 6MB. 7. Add videos and optimize them for search. Optimizing your channel for discoverability is just the beginning. Once you start adding videos, you'll want to optimize them for search, which in turn helps users discover your video. When we search for videos, one of the first things that our eyes are drawn to is the title. 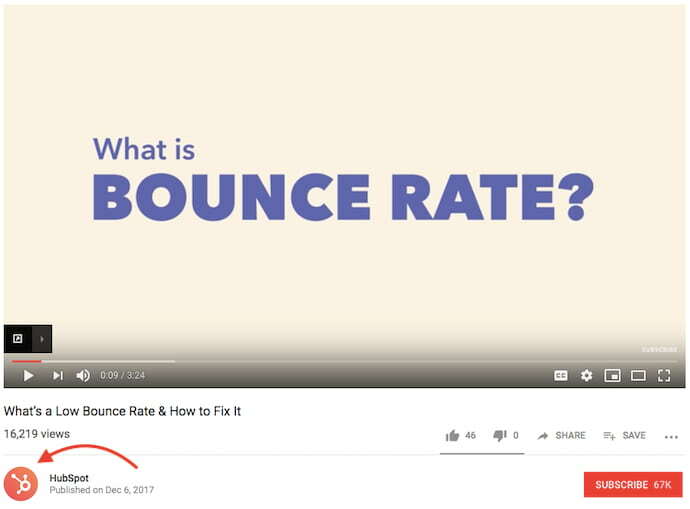 That's often what determines whether or not the viewer will click to watch your video, so the title should not only be compelling, but also, clear and concise. This should be limited to 1,000 characters -- and remember that your viewer came here to watch a video, not to read a lot of text. Plus, YouTube only displays the first two or three lines of text, which comes to about 100 characters, so front-load the description with the most important information. Using tags doesn’t just let viewers know what your video is about -- they inform YouTube, too, which uses tags "to understand the content and context of your video," according to Backlinko. That way, YouTube can associate your video with similar videos, which can broaden your content's reach. But approach with caution -- just as with your title, don't use misleading tags because they might get you more views -- in fact, Google might penalize you for that. Who are the top creators within the category? What are they known for, and what do they do well? Are there any patterns between the audiences of similar channels within a given category? Do the videos within a similar category have share qualities like production value, length, or format? That's it -- you've officially not only created a YouTube channel, but now also know how to optimize its content for discoverability. For more information on how to best leverage YouTube for marketing, check our entire collection of resources.